Business phone systems for professional services. Phone service is a critical component for a wide variety of industries, including architecture, accounting, design, consulting, and many others. In order to put your best foot forward for your business and keep your clients happy, you will need an office phone service that embraces digital technology while still offering all of the classic features you need. What do people who work in professional services need from a business phone service? If you’re working on a team or running a business on your own, finding the best business phone service while staying within your budget is important. That’s why Ooma offers more than 35 advanced features at a low monthly rate of $19.95 per user. See how much you can save by using our interactive savings calculator. You might have tasks that take you from your desk, whether it’s meeting with clients or suppliers, checking out an event space, or simply working remotely. This is why mobile access to your main business line is also important. Although it might be tempting to simply use your personal cell phone for business calls, it lacks professionalism. With the Ooma Office Mobile App, you can easily answer office phone calls, even if you are away from your desk. Find out how this bookkeeping company stayed in touch with clients, ported their existing business number and decreased phone bill expenses with Ooma Office. For my business, I need solutions that are efficient and economical. For any business looking for that combination in their phone service, Ooma Office is the best choice they can make. See how this growing healthcare company used Ooma Office’s virtual receptionist and call forwarding features to better serve their patients. Multi-level virtual receptionist: This feature not only helps you present a professional image, but it handles incoming calls and makes it easy for callers to reach the right person at your company. Mobile access to your business line: If your work takes you away from the office, you can still take your business line with you. Thanks to the Ooma Office Mobile App, you can handle business communications from your smartphone using your office number. Free toll-free and local number: Create a more established business presence by choosing a free toll-free and local number for your customers. This is included with every Ooma account, and we can even port an existing business number over to Ooma if you already have one. 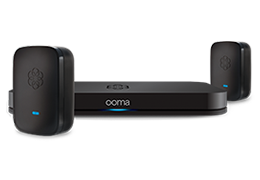 All-inclusive pricing: With Ooma, there are no setup or installation fees, or unexpected add-ons. Every Ooma account comes with all of the great business features you love with a low monthly price of just $19.95 per user. Easy DIY setup: Many Ooma Office customers are up and making business calls within minutes. Our DIY setup means you’ll never have to pay for an expensive or time-consuming office phone installation. Ooma Office can modernize your business phone system at a price you can afford. Visit our small business main page to learn more about features, benefits and pricing. Watch the video below to see how a Bay Area law firm fielded client calls using the Ooma Office Mobile App and saved on its business phone bills.